Jesse dives deeper into his search for God with Cassidy. They must take a detour to save Tulip as we discover more about her secret past. Rather a slow episode considering the mad violence of the previous episodes. I flet there was too much focus on Eugene, and I had to wait till almost the end until there was resolution of the various side stories. And of course the cowboy is still on the trail. The show reminds me a lot of the comic, in the end (even with all of the changes to the source material). The Hitler stuff made me uncomfortable, even though I think what they did with it basically worked. Making him into a pathetic figure instead of some towering Hell superstar was a good choice if they were going there at all, just not sure what they accomplished by going there. Apart from that, I agree that it was slower, but I didn't really mind. On some shows, I really want them to get to the point - I was impatient with Lost starting midway through S1, for instance. On other shows, the side stories are more the point, and so I don't mind if it takes them awhile to reveal what's going on. The world of Preacher is so bizarre and entertaining that it's fine with me if they meander to the conclusion of the actual plot. The focus on Eugene lets us all ponder the age old question: would you kick a reformed Hitler when he's down? Slower is right, but that's not necessarily a bad thing in and of itself. I liked pretty much the whole thing and I'm interested in where the Hell stuff is going even if it doesn't really connect with the rest of the plot yet. Based on some of Hitler's faint smiles (I think, they were faint) when Eugene wasn't looking it's possible Hitler has some thoughts that Eugene is his ticket out. Eugene doesn't (yet) belong there and he's presumably going to get out eventually and it seemed like Hitler was picking up on that. 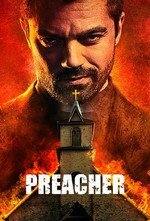 Green With You, I'm now imagining Preacher as the prequel to Look Who's Back. I know Tulip has been set up as hating Preacher's power. But why didn't she have enough sense to know he could walk into Viktor's place and command him and hia goons to never even think of her again? Maybe she did, and she wanted him to do so on his own, instead of telling him she wanted his help? If she could handle it on her own, great. If not, Jesse comes in to save her. Until someone has their earbuds up too loud. Oh, I LOVED that Pet got impaled with the dead guy on the foosball pole! Comic genius! But why didn't she have enough sense to know he could walk into Viktor's place and command him and hia goons to never even think of her again? In her shoes, I might honestly prefer to work stuff out with Viktor without involving him too, just to keep it from getting messy. Plus: none of them really understand the limits or implications of Genesis. Like, it works, but are the compulsions forever? Do they wear off? Does something bad happen if someone is under a long term compulsion? We know a lot that stuff in the audience, but the characters can't be as sure of exactly what Jesse can - or should - do. There are very clear answers in the comics for how long those instructions last and how seriously people are forced to heed them, with very clear demonstrations of each. I've been hoping for one or more of those scenes to pop up. Oh sure. Like I said, *we* know. I remember Hoover. But without that sort of information, the best they currently know is 'a literal angel from Heaven said don't use it' and 'Genesis exploded everyone it bonded with except Jesse.' Neither are particularly encouraging. Plus, moral implications. Another factor to consider: admitting to Jesse that she needs help means showing vulnerability, *and* letting him know how badly she screwed up. He'd help her in a heartbeat, but he'd also have questions that she clearly wouldn't want to answer. I sort of hate the 'Main Characters Hide Stuff' trope, (I'm caught up on Supernatural, to give you some idea of how overused I think this notion is), but it's completely in character for TV-Tulip at this juncture. Telling Cassidy is easier because she doesn't care what he thinks, and as a shady person himself, he'd be more liable to understand even if she did care. I just wanted to point out that it's hilarious that Mark Harelik played himself, the actor playing God. I don't think he's that lowly enough to be represented by what seems like a 2-bit agent in New Orleans, I think the real Mark Harelik is probably out in LA somewhere.